VALLEY, Virgin Gorda, VI- With the 5th Virgin Gorda Half Marathon and 6 Mile Challenge just two weeks away, more than 15 runners from Tortola made their way over to Virgin Gorda on April 30, 2016 to compete in the 2nd leg of the Dive BVI 10K Series, which took in the second half of the half marathon course. The visiting runners also ensured a clean sweep of the 2-race series as Reuben J. A. Stoby and Maria Mays were the respective male and female winners. Stoby, who was chased by another Tortola runner, Julius Farley, for much of the way, won in 41:53. Farley was second and Virgin Gorda resident Curwin Andrews third. 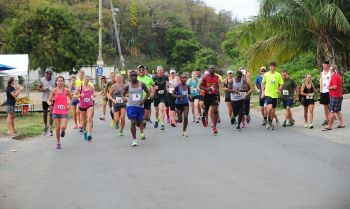 The course took the some 38 runners on a tour of Copper Mine and The Baths and was seen as the final tune up for the 5th Virgin Gorda Half Marathon on May 14, 2016. "The course is a tough one no doubt so am not too disappointed with my time at all. The race gave me an opportunity to re-familarise myself with the course and to plan my strategy for the half marathon," Stoby said. Meanwhile, Maria Mays clocked 47:41 to win for ladies and was also the third athlete overall to complete the tough course. Melissa Brunner was second, Kim Takeuchi third, Kat Brownsdon fourth and Rosmond Johnson 5th. Male: Reuben Stoby, 41 minutes and 53 seconds. 2. Julius Farley, 43:28. 3. Curwin Andrews, 48:47. 4. Brian Davis, 50:21. 5. Adrian Dale, 51:32. 6. Zebalon McClean, 52:35. 7. Ishwar Persaud, 52:59. 8. Gabriel Obregon, 55 :05. 9. Marlon Felix, 55:29. 10. Gus Faller, 56:41. 11. Patrick Ormond, 56:47. 12. Mahinda Ratnayake, 58:24. 13. Dennis Versoza, 59:53. 14. Aaron Gardner, 1:00.11. 15. Damien Parry, 1:02.31. 16. Teejay Torres, 1:05.37. 17. Andy Miller, 1:13.55. 18. Dan Starling, 1:17.59. DNF: Emily Drinkwater & Brendan O'Reilly.